The worst maritime disaster in America occurred April 27,1865, north of Memphis on the Mississippi River. 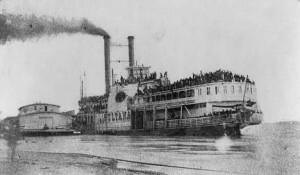 A steamship that was being used to transport returning Union prisoners of war from Confederate prisons to their homes in the Midwest area of the country exploded and sunk. There are a lot of mysteries and questions about the SS Sultana tragedy. The new technologies of steamboat engines, the making of repairs, the greed and conspiracies of Army officers and the Sultana officer, the amount of prisoners put on the ship, the operation of the ship on the flooded Mississippi, the government investigations, the trial to fix blame, the rescue and recovery efforts of the Navy and civilians, why was there no outcry from Americans, how could they ignore approximately 1700 dead from this disaster and now the question of sabotage. A subject of the Civil War that had been forgotten from the time it happened up to the 1960s (one book was written in 1892). Several books and articles have now been researched and written starting in the 1960s. And now the Sultana’s location has been found and the possible excavation of the remains may be in the future. After 150 years a lot of questions are still unanswered. An ancestor of Don’s was a prisoner in Andersonville and was on the Sultana and survived. Hear his unique story. Don Wiles is a member of Old Baldy CWRT and is an amateur historian whose main interest is Gettysburg. His interest in the Sultana was generated by his interest in his family’s genealogy. Don is retired from 50 years as an Illustrator for industrial and commercial companies. He worked at the Kennedy Space Center doing illustrations for the Astronauts, NASA and companies during the Gemini, Apollo, Skylab, Soyuz, Shuttle, and various Satellite programs. He also did an illustration of the missile cruiser CG 64 Gettysburg for the commissioning in Philadelphia. Don lives in Mount Laurel, New Jersey. This entry was posted in Meeting archive on January 30, 2015 by hlj.